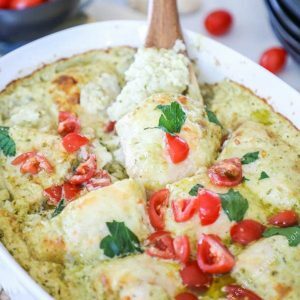 This Creamy Pesto Chicken Casserole is knock your socks off delicious! 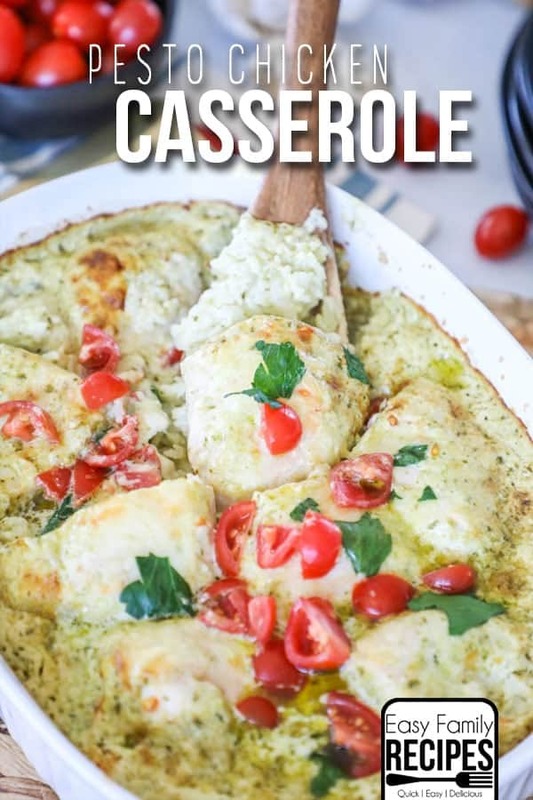 It combines tender chicken with rice, pesto and creamy cheese, all baked together in one dish for a perfect easy weeknight dinner. Not only is this meal super tasty, it also feeds a crowd so it is perfect for serving guests or a house full of hungry kids. Pesto is one flavor that my family just loves. From adult to kids, I use it on quite a lot of dishes (like my popular Caprese Chicken) and everyone in the family will gobble them up. Pesto just has the perfect balance of richness and freshness, and of course garlic, which probably deserves a category all on it’s own. This casserole though, is pure dinnertime magic! I like to think of it almost like a cheater risotto recipe. The chicken and rice all cook together in the oven as it bakes making this a true one dish dinner. With easy prep and easy clean up, what more could you want?! My kids clean their plates just about as quickly as we do, and in the end you just have a couple of dishes to clean up. When it is this easy, and this delicious, you pretty much win the dinnertime battle every time! If you want to keep it super simple, this dish has enough substance on it’s own to serve alone and is enough to be filling and delicious. If you want to add a little something to it though to round out the meal there are several great options from simple, to healthy, and a few in between. You can pick one or a couple of these to pair with the Pesto Chicken Casserole. I think it goes especially well with the veggies since you already have your meat and starch all wrapped up in the casserole. If you have another dish you love to serve this with, I would love for you to leave me a note in the comments so I can try it out. This recipe really is super simple. I will go through a few notes with you here to hopefully answer any questions that might come up. If there is something I didn’t answer you can ask . in the comments and I will try to get back to you on it! You can find the FULL recipe card for this recipe down at the bottom of this post. 2 lb boneless, skinless chicken breast– This is about 3-4 average sized chicken breasts. You can also use chicken tenderloins if you prefer. 1 1/2 cup jasmine rice or 2 cups quick cooking rice (uncooked)- I used jasmine rice in my casserole, however you can use quick cooking rice if you prefer. I tend to like the taste and texture of the jasmine rice better overall. 8 oz cream cheese, softened- You can use regular cream cheese or low fat cream cheese, just steer clear of fat free cream cheese because it won’t melt the same way. Make sure that your cream cheese is very soft so that it combines evenly. If it is not softened you can put it into a microwave safe bowl and heat it at 30 sec increments, stirring in between, until it is smooth and creamy. 1/3 cup pesto (prepared)- I really like both the Kirkland brand from Costco and the Sams Club brand, both found in the refrigerated section. If you prefer to make your own, here is a recipe for homemade pesto. 2 cups chicken broth- This is the liquid that the rice will absorb as it cooks. Using chicken broth makes the dish super flavorful. If you are in a pinch, you can use bullion cubes dissolved in water. A: The rice should be uncooked when you mix it into this recipe. The rice will cook and absorb the liquid in the dish to become perfectly tender by the end of the cook time. Can I use cauliflower rice or another rice substitute in this recipe? A: Because the rice cooks in the liquid and absorbs it, precooked rice or other rice substitutes that do not absorb liquid will not work in this recipe. 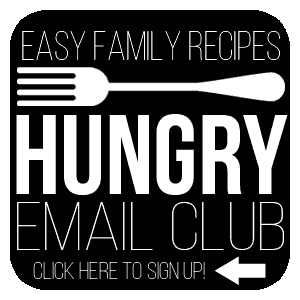 Can I use chicken thighs or other cuts of meat in this recipe? A: Yes you should be able to use whatever your favorite cut of poultry is, as long as it is boneless and skinless. Depending on what you use, the cooking time may be altered. The top of the casserole is greasy at the end of cooking. Is that normal? A: Since pesto is made primarily from basil leaves, garlic, oil, and cheese, the oil in it can become thinner and settle at the top of the casserole while baking. This is not a concern. You can either stir it back in to flavor the casserole, or you can use a spoon to remove some of the excess oil. Does this dish accommodate special dietary restrictions? A: This dish is naturally gluten free. This dish cannot be easily adapted to be dairy free or grain free. I really hopeful that this answers most any question that comes up to make preparing this dish super easy. If not, please feel free to leave me a note in the comments! This is such a well loved meal for our family, and I hope that your family enjoys it just as much! 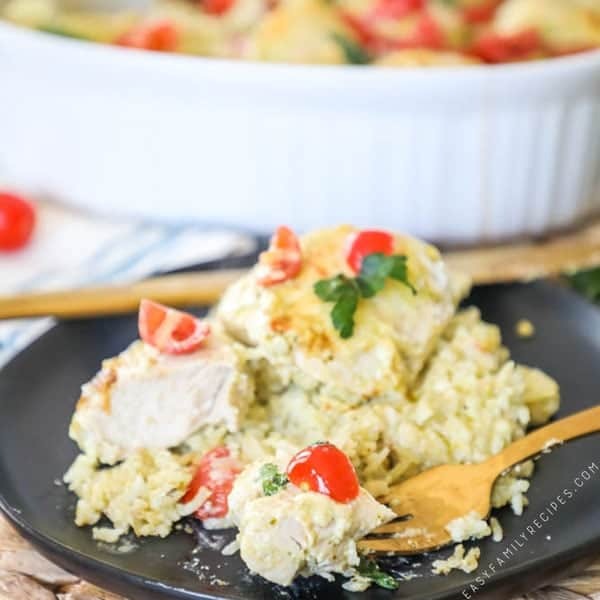 This Creamy Pesto Chicken Casserole is a huge crowd pleaser and a delicious one dish meal! The delicious pesto flavor envelopes the chicken and rice and is made over the top delicious by the creaminess. This is a perfect easy dinner idea and will easily feed a crowd. Leftovers reheat perfectly to eat for lunches throughout the week. Combine the cream cheese, pesto and chicken broth in a bowl and whisk until smooth. Stir in the rice and then pour the entire mixture into a large casserole dish. Trim the chicken, then cut it into roughly even pieces around 2 inches each. Place the chicken pieces evenly over the top of the rice mixture and gently push down until just covered in the liquid. Sprinkle the top of the casserole with the mozzarella cheese. Bake for 50-60 minutes or until the chicken is cooked through, and the rice is tender and has soaked up all of the liquid. Enjoy! Yes! I also love it on a bed of sauteed spinach. I had plans to make this dsh, but I forgot to take the chicken out of the freezer. We turned to pizza. Will be trying Tuesdays dinner. I’ll probably make this again but will add salt and pepper. Made this for dinner tonight and it was delicious! !it is going in the meal rotation for sure!